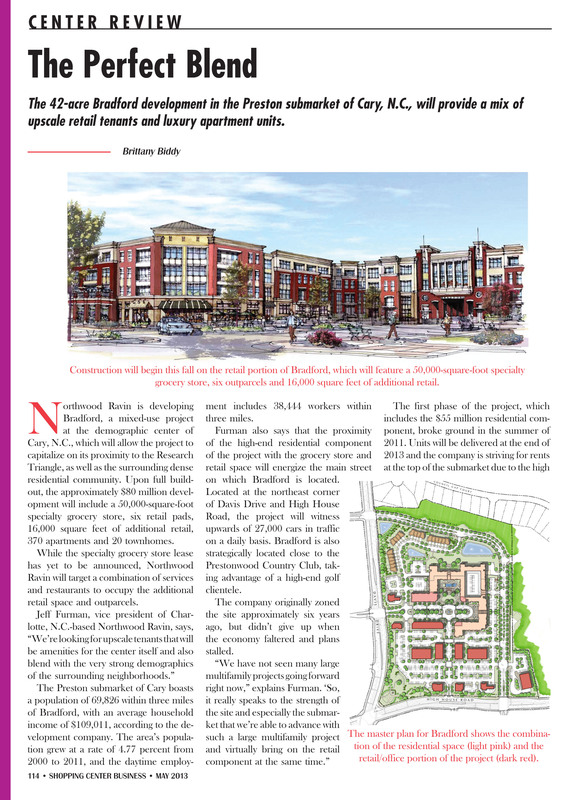 The 42-acre Bradford development in the Preston submarket of Cary, N.C., will provide a mix of upscale retail tenants and luxury apartment units. Construction will begin this fall on the retail portion of Bradford, which will feature a 50,000-square-foot specialty grocery store, six outparcels and 16,000 square feet of additional retail. Northwood Ravin is developing Bradford, a mixed-use project at the demographic center of Cary, N.C., which will allow the project to capitalize on its proximity to the Research Triangle, as well as the surrounding dense residential community. Upon full build-out, the approximately $80 million development will include a 50,000-square-foot specialty grocery store, six retail pads, 16,000 square feet of additional retail, 370 apartments and 20 townhomes. While the specialty grocery store lease has yet to be announced, Northwood Ravin will target a combination of services and restaurants to occupy the additional retail space and outparcels. The Preston submarket of Cary boasts a population of 69,826 within three miles of Bradford, with an average household income of $109,011, according to the development company. The area’s population grew at a rate of 4.77 percent from 2000 to 2011, and the daytime employment includes 38,444 workers within three miles. Furman also says that the proximity of the high-end residential component of the project with the grocery store and retail space will energize the main street on which Bradford is located. Located at the northeast corner of Davis Drive and High House Road, the project will witness upwards of 27,000 cars in traffic on a daily basis. Bradford is also strategically located close to the Prestonwood Country Club, taking advantage of a high-end golf clientele. The company originally zoned the site approximately six years ago, but didn’t give up when the economy faltered and plans stalled. The first phase of the project, which includes the $55 million residential component, broke ground in the summer of 2011. Units will be delivered at the end of 2013 and the company is striving for rents at the top of the submarket due to the high quality of the residential component. The retail portion of Bradford is currently undergoing the town’s site plan approval process, but Northwood Ravin expects to break ground later this fall. Crosland Southeast will be in charge of leasing the retail space. Northwood Ravin is concentrating on energizing the space at Bradford by encouraging restaurants to take advantage of the patio space the project offers. The company hopes to secure a blend of fast/casual chains, as well as upscale restaurants for the mixed-use project. “We’ll definitely encourage outdoor seating to energize the main street and all of the public amenities we’re bringing on board with the project,” says Furman. Additional features at Bradford will not only cater to the residents living on the property, but also retail customers. Bradford expects to create a place where shoppers will stroll and neighbors will gather. Northwood Ravin has incorporated a public plaza and a multitude of pedestrian-friendly walkways in the site plan in order to provide an experience for the neighborhoods and the residents.